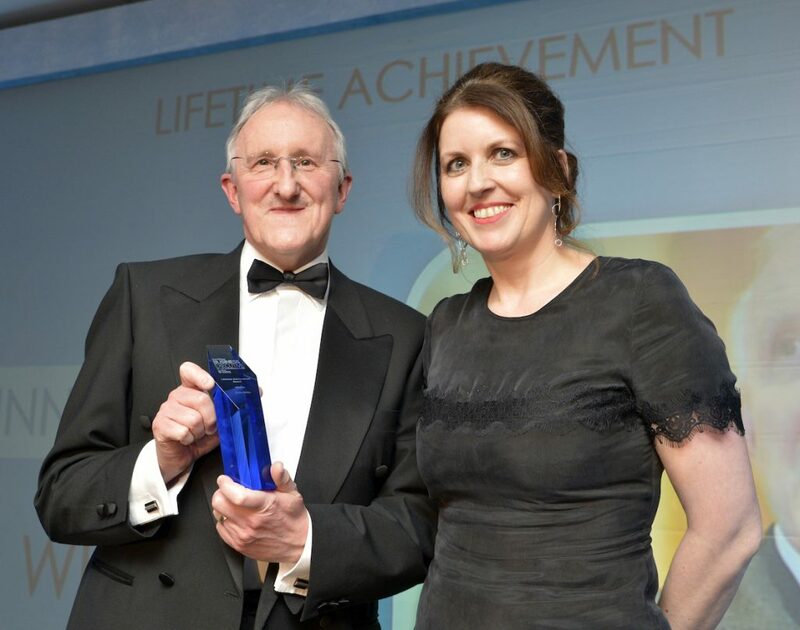 Hinckley & Rugby Building Society’s newly retired chief executive Chris White has been presented with a Lifetime Achievement Award by the Leicester Mercury. Chris, who stood down in December after 30 years at Hinckley & Rugby, was surprised with the special award at the Leicester Mercury Business Executive of the Year Awards. “Our winner took on the role of chief executive just before the onset of the credit crunch – a tumultuous time and it hit nowhere harder than in financial services. “To steer this business through troubling times, when others were crashing and merging, and to lead it onwards into successive years of growth and profitability is a substantial achievement. to them as much as me. “I have enjoyed every minute of my three decades at the Society. It has been a pleasure to work in an organisation that genuinely puts the interests of its customers first. “Chris is an exceptional chief executive and the Society has been very fortunate to have him at the helm. “Not only did he skilfully steer Hinckley & Rugby through the difficult years of the credit crisis but throughout he remained true to the ethos of building societies, always putting the interest of members first. Before retiring, Chris handed over the reins to the Society’s new chief executive, Colin Fyfe, who joined from Darlington Building Society.